• A love letter Romantic poet John Keats wrote to his beloved Fanny Brown will be returned to the house in which it was written. Keats wrote the letter in 1820 while living next door to her at Wentworth House in Hampstead, north London – his home from 1818 to 1820 and the setting that inspired some of his most memorable poetry including Ode to a Nightingale. The City of London Corporation, who manage the house – now a museum known as Keats House, recently purchased the letter with the support of the Heritage Lottery Fund for £80,000. They say it will now be returned to the house and displayed there. In the letter Keats wrote: “I shall Kiss your name and mine where your Lips have been – Lips! why should a poor prisoner as I am talk about such things.” He said his consolation was “in the certainty of your affection”. See www.keatshouse.cityoflondon.gov.uk. • Amid the host of souvenirs and trinkets up for sale in the lead-up to the wedding of Prince William and Catherine Middleton comes news of a unusual offering from Transport for London – a limited edition royal wedding Oyster card. The card, which will go on sale in the week leading up to the ceremony, features a portrait of the couple and their wedding date – 29th April, 2011. More than 750,000 of the cards will be offered for sale. The move is not without precedent – in 1981, a unique ticket was produced for the marriage of Prince Charles and Lady Diana. • Squadron Leader Geoffrey Wellum, the youngest Spitfire pilot to take part in the Battle of Britain, was granted the Freedom of the City of London at a ceremony at Guildhall last week. Wellum was just 18-years-old when he joined the RAF in August 1939. Serving in a frontline squadron, he flew many combat missions including dogfights during the Battle of Britain and was subsequently awarded the Distinguished Flying Cross. • On Now: The Cult of Beauty: The Aesthetic Movement 1860-1900 at the Victoria & Albert Museum in . Said to be the “most comprehensive” exhibition ever staged on the Aesthetic Movement in Britain, it brings together masterpieces in painting as well as sculpture, design, furniture, architecture, fashion and literature of the era and explores some of the key personalities involved in the movement – from William Morris and Frederic Leighton through to James McNeil Whistler, Dante Gabriel Rossetti, Edward Burne-Jones and Oscar Wilde. Organised in collaboration with the Fine Arts Museums of San Francisco, the exhibition runs until 17th July. Tickets are £12 (concessions available). See www.vam.ac.uk. • London will celebrate Chinese New Year this Sunday as it once again hosts the largest celebrations outside of Asia attracting some 250,000 people from around the globe. The event programme, which celebrates 2011 as the Year of the Rabbit, kicks off at 11am on the main stage in Trafalgar Square with firecrackers at noon, a Lion and Dragon performance at 1.10pm and dance and song during the afternoon culminating in a finale just before 6pm. There will also be a stage in Shaftesbury Avenue with performances throughout the day. Roads in the area will be closed for the event. • You no longer have to be in London to walk through the galleries of the Tate Britain or the National Gallery. Both institutions are among 17 around the world taking part in the Google Art Project which allows web surfers to virtually “walk” around the museum using the organisation’s Street View technology and turn 360 degrees to view the artworks in situ on the walls. The project also allows viewers to look through images of more than 1,000 artworks and, in addition, each institution has selected one artwork which then captured in “super high resolution” and then placed on line (Hans Holbein’s The Ambassadors‘ for the National Gallery, Chris Ofili’s No Woman, No Cry for the Tate). See www.googleartproject.com for more. • Cyclists have ridden the distance to the moon and back 13 times – 10 million kilometres – since the launch of Mayor Boris Johnson’s cycle scheme. Transport for London released figures this week showing riders have made more than 2.5 million journeys on the “Boris bikes” since the scheme was launched six months ago. The TfL has announced plans to expand the Barclays Cycle Hire scheme to new areas of east London including all of the Borough of Tower Hamlets, North Shoreditch, Bethnal Green, Bow, Canary Wharf, Mile End and Poplar by spring 2012. Almost 110,000 people are now signed up to the scheme. www.tfl.gov.uk. • The youngest Spitfire pilot in the Battle of Britain is to be granted the Freedom of the City of London in a special ceremony next month. Squadron Leader Geoffrey Wellum was awarded the Distinguished Flying Cross for his service in a front line squadron during the battle. It’s Remembrance Day and all across the UK – and around the world – people are pausing to reflect on those who gave their lives fighting for their country. While the main events related to the day – the laying of wreaths at the Cenotaph and a parade – takes place on Remembrance Sunday, we’re marking the day today with a list of 10 of London’s World War I and II-related war memorials. 1. 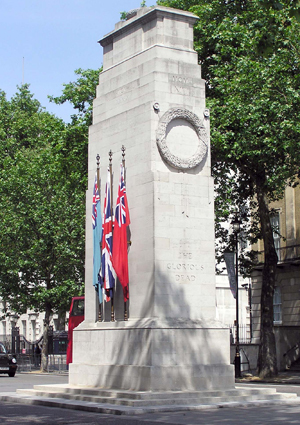 The Cenotaph – The most famous of London’s war memorials (pictured right), this simply designed – almost plain – monument stands in the middle of Whitehall and was designed by Sir Edwin Lutyens to commemorate the dead of World War I. It is here that the Queen and other dignitaries lay wreaths on Remembrance Sunday in remembrance of the war dead of both world wars. 2. The Monument to the Women of World War II – Located just along from the Cenotaph, this much criticised memorial marks the role more than seven million women played during World War II. Unveiled in 2005, the memorial was designed by John W. Mills and depicts a series of coats worn by women during the war hanging as though on pegs. 3. 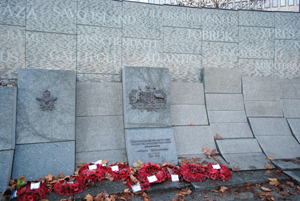 The Tower Hill Memorial – This memorial, which was originally unveiled in 1928 and then added to after World War II, commemorates the men and women of the merchant navy and fishing fleets who were killed in either world war and have no known grave. It lists more than 36,000 names. For more information, see www.cwgc.org/search/cemetery_details.aspx?cemetery=90002&mode=1. 5. 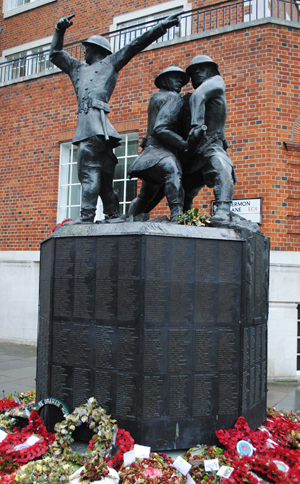 The National Firefighters Memorial – Marking the role played by firefighters during the Blitz of London in World War II (as well as the role of firefighters generally), the memorial (pictured right) was designed by John Mills and features the “Blitz” statue – two life-sized firefighters and an officer cast in bronze – standing atop a plinth. First unveiled in by Queen Elizabeth II in 1991, it originally featured the names of 997 men and women who died during the Blitz inscribed upon it but this was extended to include firefighters who have died in peacetime and an additional 1192 names were added prior to a rededication in 2003. Located just south of St Paul’s on the main route to the Millennium Bridge, it is the focus of the annual Firefighters Day of Remembrance held each September. For more information, see www.firefightersmemorial.co.uk. 8. Australian War Memorial – Located close to Wellington Arch at Hyde Park Corner, this monumental wall (pictured right) marks the role Australians played in both World Wars. More than 100,000 Australians died during the conflicts and the names of the 23,844 towns in which they were born are inscribed on the wall over which is superimposed the names of 47 battles in which Australians fought in. Unveiled on the 85th anniversary of Armistice Day, 2003. 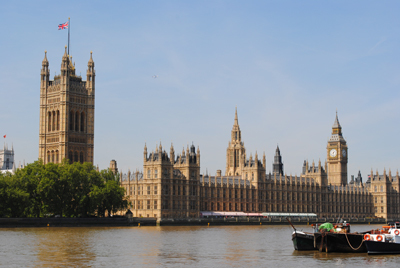 For more information, see www.awmlondon.gov.au. 9. New Zealand War Memorial – Located at Hyde Park Corner diagonally opposite the Australian War Memorial, this monument was designed by architect John Hardwick-Smith and sculptor Paul Dibble and features 16 bronze cross-shaped ‘standards’ of varying heights set in formation and inscribed with text, patterns and some small sculptures. Dedicated on Armistice Day, 2006, by Queen Elizabeth II. 10. 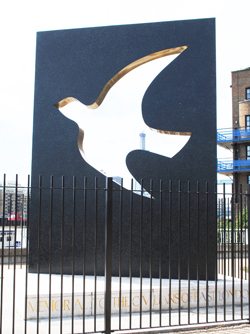 Soviet War Memorial – Found in the Geraldine Mary Harmsworth Park – adjacent to the Imperial War Museum in Southwark, the Soviet War Memorial was unveiled in 1999. Designed by sculptor Sergei Shcherbakov, it commemorates the 27 million people who died in the Soviet Union during World War II. For more information, see www.scrss.org.uk/sovietmemorial.htm.